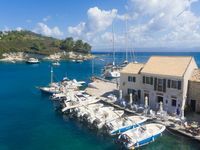 Properties in Port of Igoumenitsa average 4.4 out of 5 stars. THE MAYFLOWER STUDIOS - EVERYTHING YOU NEED FOR A RELAXING HOLIDAY ! Property 4: THE MAYFLOWER STUDIOS - EVERYTHING YOU NEED FOR A RELAXING HOLIDAY ! Poppy Apartment - one bedroom with dramatic views over the bay of Loggos. Property 16: Poppy Apartment - one bedroom with dramatic views over the bay of Loggos. Chrysoula (Loggos) Two bedroom Apartment situated in the heart of Loggos. Property 45: Chrysoula (Loggos) Two bedroom Apartment situated in the heart of Loggos. Nice and friendly environment. It was the perfect Village/beach holidays. Could not have asked for more. 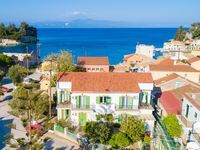 We enjoyed our week in Loggos and the picturesque setting of the apartment which made up for some of the quirky aspects (low sloping ceiling of the bedroom, the open staircase and limited work surface in the kitchen). Would consider staying at the apartment again but might first look for a potentially quieter location (no problem with noise from the bars at the tail end of the season but one night spoiled by inconsiderate user of a yacht moored at the end of the pier - started to play loud music at 00:40 hrs).